Former U.S. vice president Joe Biden says he doesn’t believe he ever acted inappropriately toward women but will “listen respectfully” to suggestions he did. Biden, who is deciding whether to join the 2020 presidential race, faces allegations from a former member of the Nevada State Assembly that he kissed her on the back of the head in 2014 and made her uncomfortable. Lucy Flores outlined the allegation in an online essay published on Friday. The Democratic party activist, says the “awkward” incident occurred in Las Vegas as she and Biden were lined up to go on stage at a campaign rally. At the time she was 35 and the Democratic nominee for Nevada lieutenant governor. She later lost that race to the Republican candidate in the Nov. 4 U.S. elections. Flores said Biden put two his hands on her shoulders from behind, sniffed her hair and then planted a kiss on the back of her head. Bill Russo, a spokesperson for Biden, said on Saturday that the former vice president does not recall the incident. Responding to the accusation, Russo said Biden had been happy to support Flores and to speak on her behalf at the event. “Neither then, nor in the years since, did he or the staff with him at the time have an inkling that Ms. Flores had been at any time uncomfortable, nor do they recall what she describes,” Russo said on Friday in a statement. 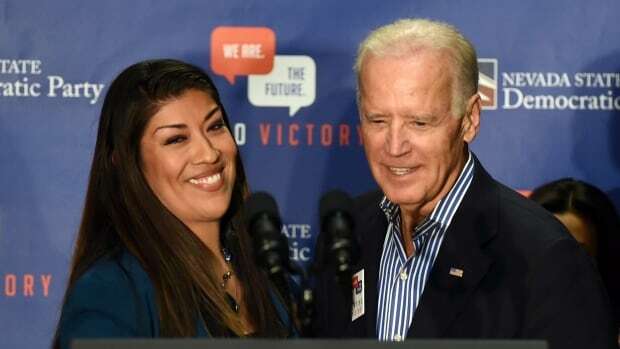 Biden believes Flores has every right to share her own recollection, Russo added, and that it is a positive change for U.S. society that she has the opportunity. In a separate statement on Saturday, Russo said: “People know Joe Biden and they know his character, his integrity and his values,” adding that he was a champion for women. Some of his potential rivals for the Democratic party’s nomination to take on Republican Donald Trump addressed the allegation on Saturday. Elizabeth Warren, a U.S. senator from Massachusetts, told reporters in Iowa that she believed Flores. Julian Castro, a former U.S. secretary of housing and urban development from Texas who is also running for president, said he also found Flores credible, according to news reports. Flores supported Bernie Sanders in his losing 2016 bid for the Democratic nomination. Although the U.S. Senator from Vermont is running again, Flores has said on Twitter that she has not endorsed any of the candidates in this race. Should Biden decide to run in 2020, after failed bids to be the party’s nominee in 1988 and 2008, he will be a key figure in the Democratic debate over whether a liberal political newcomer or a centrist veteran is needed to win back the White House.